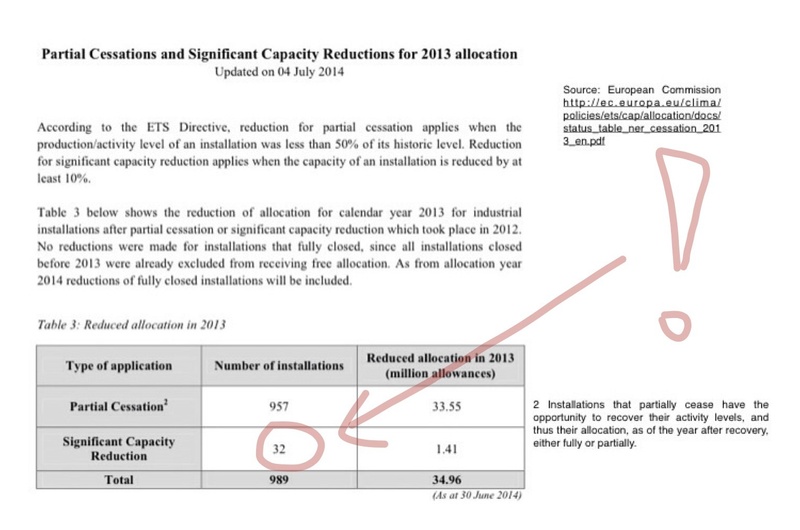 Installation's capacity reductions need always be considered in the context of potential EUAs allocation. The allocation to the installation is adjusted accordingly as of the year following the one during which the capacity reduction took place. The general rule determining free allocation for industrial sectors as from 2013 is that the amount of allowances allocated free of charge to incumbent installations is based on historical production levels – i.e. median production during the period from 1 January 2005 to 31 December 2008, or, where it is higher, on the median production during the period from 1 January 2009 to 31 December 2010. However, after the initial allocation for the period 2013-2020 the capacity of the installation may be reduced for different reasons. Significant changes between 1 January 2005 and 30 June 2011 impact the historical activity level. Given that changes after 30 June 2011 are subject to new entrant/closure regulations, adjustments in allocation for significant capacity reductions according to new entrant/closure rules can only be made if the changed operations start after 30 June 2011 (for exceptions see Guidance Document n°7 on the harmonized free allocation methodology for the EU-ETS post 2012 Guidance on New Entrants and Closures Final version issued on 14 September 2011). 1. Where an installation has had a significant capacity reduction after 30 June 2011, Member States shall determine the amount by which the number of allowances to be allocated for free is reduced, in so far as this reduction is concerned. 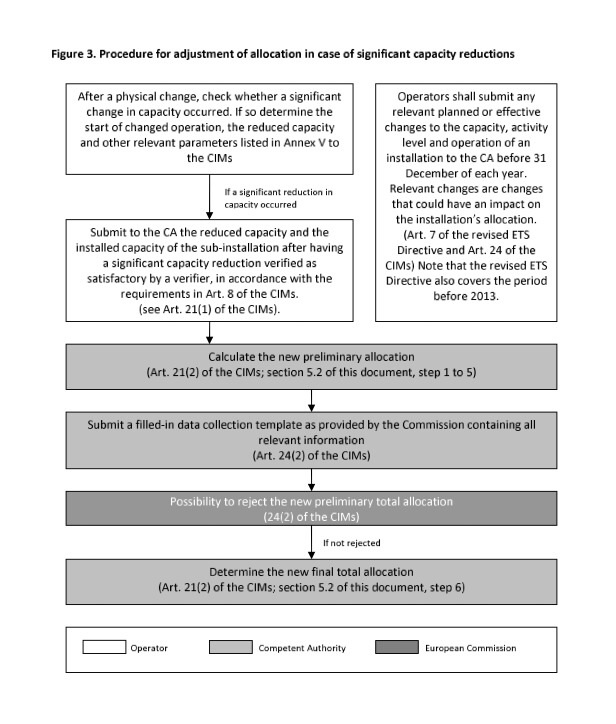 To this end, the Member States shall require the operator to submit the reduced capacity and the installed capacity of the sub-installation after having had a significant capacity reduction verified as satisfactory by a verifier, in accordance with the requirements set out in Article 8. Member States shall consider this installed capacity of the subinstallation after having had a significant capacity reduction as the sub-installation's initial installed capacity when assessing any subsequent significant capacity change. 2. Member States shall reduce the preliminary annual number of emission allowances allocated free of charge for each sub-installation by the preliminary annual number of emission allowances allocated free of charge for the sub-installation concerned calculated in accordance with Article 19(1) insofar as the significant capacity reduction is concerned. For the correction of the allocation only capacity reduction which is “significant” in the meaning of Article 3(j) of the Benchmarking Decision (Commission Decision of 27 April 2011 determining transitional Union-wide rules for harmonised free allocation of emission allowances pursuant to Article 10a of Directive 2003/87/EC of the European Parliament and of the Council (referred to in the attachment as 'CIMs')) is relevant. - one or more physical changes led to a decrease in allocation to the subinstallation of more than 50 000 allowances and the difference represents more than 5% of the amount of allowances calculated irrespective of the physical change. - after one or more physical changes at the heat consuming facilities, the reduced consumption of heat allows the heat benchmark sub-installation concerned to match one of the two above mentioned quantitative criteria. Common feature of both cases above is the fact that a 'physical change' is made to the installation. The above-mentioned Guidance Document also clarifies that physical changes exclusively aiming at improving the energy efficiency of a subinstallation or at improving or installing an end of pipe abatement technology to reduce process emissions should not be regarded as physical change leading to a significant capacity reduction. Nevertheless, the operator needs to report such physical changes to the competent authority and, where appropriate, provide detailed evidence.